In the B&B Calcio Storico rooms are inspired by the colors of the four historical quarters of Florence, the Red room, the Green, the Blue and the White, besides the one of the “Pallaio” and the “Giglio”, symbol of Florence. Situated in a building of 800, with most of the rooms with frescoed ceilings you will breathe the air of that century. The B&B Calcio Storico is located near the characteristic quarter of San Frediano, where there are the famous “Oltrarno” churches:Santo Spirito, Carmine with the Brancalacci chapel and Cestello. And the most antiques stores of the florentine artisans. Walking through the characteristics little streets you will arrive to the imperial Pitti Palace with its wonderful Boboli Garden. The old walls of the city are very close, as is Ponte Vecchio, Signoria square, the Uffizi museum, the Duomo, the Medicee chapels and Santa Croce. An open museum that you will love for sure and that will last forever in your heart. 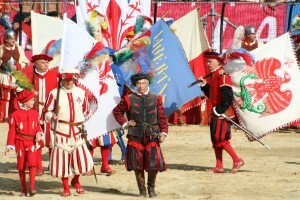 The Calcio Fiorentino also known as Calcio in Livrea has an old origin.Played every year in June, is a tournament among four teams that represent the florentine historical quarters: Whites for Santo Spirito, Blues for Santa Croce, Reds for Santa Maria Novella and Green for San Giovanni. 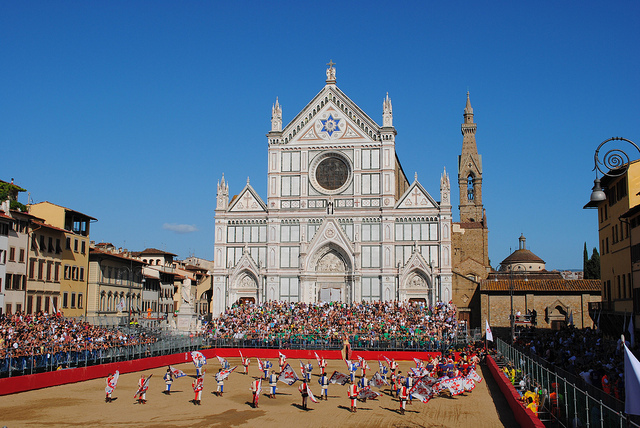 The most famous match has been the one played on February 17th 1530, when Florentines sieged by Charles V showed their indifference by playing Calcio in Santa Croce.